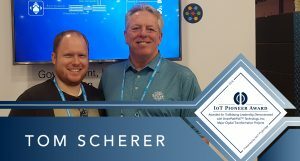 Congratulations to Cisco’s Tom Scherer for using SmartPathPoE™ technology to help a large grocery chain modernize to IP telephony. Tom recommended the enterprise-grade PoLRE® managed switch, which allowed the customer to leverage their existing and proven voice infrastructure to deploy their new Cisco IP solution. Thanks to Tom’s commitment to innovation and problem-solving, the customer reduced their infrastructure costs by over $5 million.